It has been a while since the tight, twisty Circuit Ricardo Tormo outside Valencia hosted a race with any real implications on the MotoGP championship. But this time, the epic battle between stellar talent Marc Marquez and the super-composed ultra-fast Jorge Lorenzo went down to the wire. Going into the race, Marquez only needed to finish fourth if Lorenzo won to snag the championship which everyone agreed was easy. On the other hand, Lorenzo had to climb a mountain. His strategy was singular. He had to slow the race down from the front to ensure as large a leading group as possible. This would do two things. First, it would increase the chance that Marquez would come in worse than fourth, or better still make a mistake or have an incident and drop even further way. The tricky bit was that Lorenzo had to win, no matter what. And that is how the race turned out. Lorenzo led into the first corner with Pedrosa behind him. Marquez took the inner line into turn one, Rossi graciously keeping it wide for safety while slotting neatly into fourth place. While initially both Bautista and Rossi would stay in the leading group, first the green-clad Honda and then the Yamaha would slowly fade backwards. Rossi would end the race in fourth place once again, clearly looking upset and helpless back in the pit. Jeremy Burgess, Rossi's chief mechanic for ages stood by looking the other way - the duo announced their split just the evening before the race. The race really was between Lorenzo, Pedrosa and Marquez. Marquez rode a really mature, quiet race making no real mistakes though in the initial laps, he had to brake or sit up twice while a fierce battle raged between Pedrosa - itching for a home win - and Lorenzo - fighting to stay in the lead so that he could control the pace of the race. Lorenzo led the race for the most part. Pedrosa did pass him a number of times but Lorenzo came right back into the lead pulling more than a few extremely tough passes that left Pedrosa's leathers stained or worn on both sides. Meanwhile Lorenzo ensured that the lap times were in the 1:32s, far from his best hoping that more riders would catch up. Cal Crutchlow, the person most likely to join battle, however, ended his Tech 3 Yamaha innings unhurt in the gravel trap. Something had to give. That happened when Pedrosa was in the lead but as he tipped into the corner, Lorenzo was inside and slightly behind. But the Yamaha never gave the Honda the space and in the end, Pedrosa was forced wide and nearly fell off the bike, leaving the lead for the final time to Jorge Lorenzo. Pedrosa joined back in fifth place and upped the pace to claw back into the race. Meanwhile, it appeared that Lorenzo tried to get Marquez worked up and join the scrap but the young rookie showed a really cool head for the situation and refused to rise to the provocation, lapping fast when Lorenzo did and then slowing down or passing Lorenzo when the pace changed. Ultimately, Lorenzo had no choice to but to settle for the loss of the championship with a race win. He raised the pace, pulled a gap and after that all the attention was on Pedrosa. The wee Spaniard sliced back up the order, passing Bautista and Rossi and then closing down the gap to the steady and safe riding Marquez. Marquez allowed Pedrosa safe passage into second place and that is how the race ended. Pol Espargaro as usual, was the fastest CRT bike but out on track Marquez was out celebrating. Lorenzo also celebrated a great year though he lost the championship. But the race director had taken note of that final pass on Pedrosa and decided to examine the incident later. Marquez pulled into pitlane after quite a long-drawn out celebratory lap. With his big smile out in full force, he said, "It was a really long race, maybe the longest of my career. Jorge had a very good start and I wasn't sure that which tactic to take. Then towards the end, I decided not to push as I knew my position was secure and safe to take the championship. It has been a fantastic year and I am still in a dream!" Pedrosa meanwhile dismissed Lorenzo's shenanigans in the race as a racing tactic he understood, quipping that maybe Lorenzo should have started the slow race tactic at Motegi itself for a better position at Valencia. 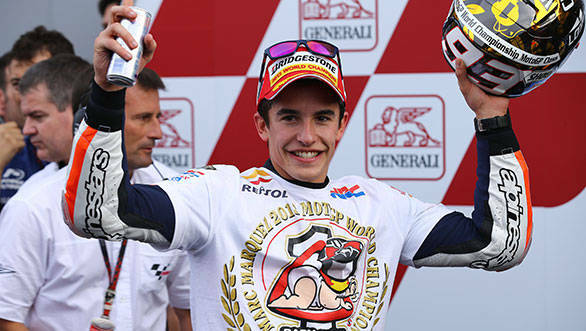 When the dust settled, Marc Marquez was confirmed as a sensational addition to the MotoGP circus. Among the various records he has broken this year - he also took home the BMW M6 Coupe for the pole position award - he is now the youngest MotoGP champion ever. Next year, Marquez returns as a favourite, Lorenzo as the slighted ex--Champion hungry to have his crown back while Rossi will start the 2014 season either as a winner or as the greatest racer of all time but a man about to retire from MotoGP. 2013 has been a great year for MotoGP, perhaps amongst the best ever. But in its last race, it's almost like a Hollywood-teaser - 2014 will be bigger and even better.